2013th March 12, Tuesday afternoon voting cardinals, the Pope entered the Sistine chapel, and took an oath of the Holy Scriptures, and said a few minutes after half past five in the extra omnes. On March 12, at 15:45 on Tuesday the Cardinals went to the house of St. Martin in the Apostolic Palace. Semi-5 at the beginning of the Pauline Chapel of the Cardinals marched in the Sistine Chapel, where the Veni Creator after singing by Giovanni Battista Re, the oldest bishop Cardinal led (he will lead the conclave, as Angelo Sodano, Cardinal-Dean last eighty years). 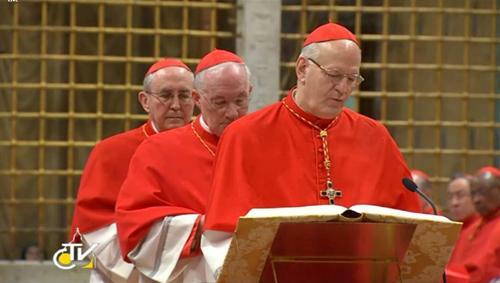 Then read from the text of the oath, and the Cardinals took the oath. Then, the papal master of ceremonies, said: Extra omnes, that leave everyone who is not taking part in the conclave. Then meditation will take place in the second and the first vote.